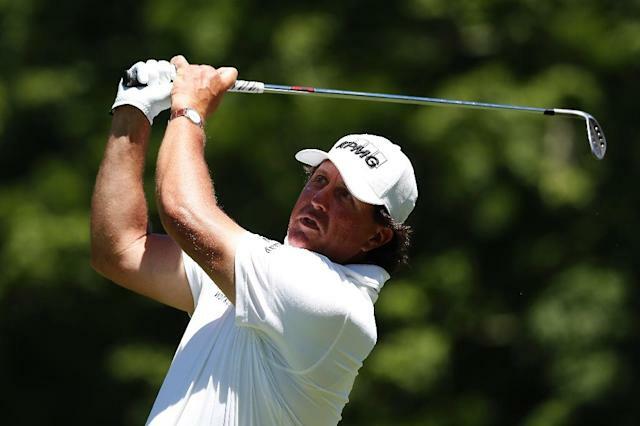 Washington (AFP) - Phil Mickelson, criticized after he absorbed a two-shot penalty for an intentional rules violation at the US Open, was on the wrong side of golf's rules again at the Greenbrier Classic on Sunday. The five-time major champion called a two-stroke penalty on himself after he tamped down some long grass with his foot in front of the tee box on the seventh hole. As he stepped back to make his tee shot Mickelson said to others in his group "I'm not sure what I just did was legal." He teed off, but after consulting a rules official, called a penalty on himself for breaking the rule barring a player from improving the area of his intended stance or swing or his line of play by actions that include "moving, bending or breaking anything growing or fixed" and "creating or eliminating irregularities of surface." Mickelson, who started the day nine shots off the pace, took a double bogey at the seventh and carded a four-over 74, which also included a triple bogey at the 18th. "I just had a few bonehead moves today," Mickelson said, adding of the infraction: "A lot of times guys just inadvertently do things, and I just wasn't thinking." Mickelson is now headed to Europe, where he is slated to play a Monday practice round at Ryder Cup host Le Golf National near Paris, followed by rounds at Gullane on Tuesday and British Open venue Carnoustie on Wednesday prior to the start of the Scottish Open.